Before beginning the recipe, prepare your pickled cabbage 3-4 hours in advance. In a large glass airtight container, combine shredded purple cabbage, apple cider vinegar, filtered water, and maple syrup. Cover and refrigerate for 3-4 hours or overnight. Prepare white or brown rice according to package instructions and set aside. Preheat oven to 400 degrees F and line a baking sheet with parchment paper. Add asparagus to the pan in an even layer and toss with avocado oil. Season with a bit of Himalayan sea salt and bake for 10-12 minutes. If you haven’t already done so, cook your hard-boiled eggs. Add eggs to a small saucepan and cover with 1” water. Bring water a rolling boil, then set timer for 6-7 minutes. Drain the water and peel the eggs under cool running water. Slice in half and refrigerate until ready to use. 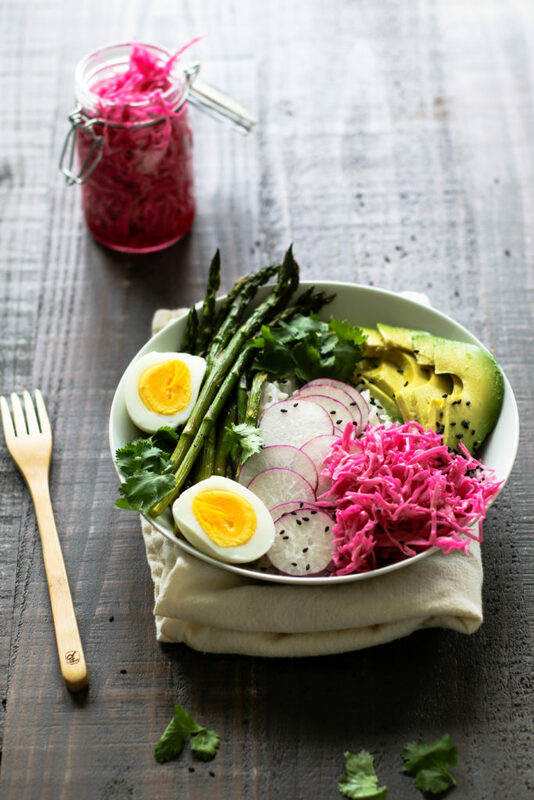 To assemble your Pickled Cabbage Spring Power Bowls, divide the rice between bowls and top with roasted asparagus, hard boiled eggs, sliced radish and avocado, and quick pickled cabbage. Garnish with optional cilantro and black sesame seeds. Store leftovers separately in the fridge for 3-5 days. Pickled cabbage will stay good for several weeks.